As a whole we don't drink that much coffee. I have GERD so caffeine and me is a no go. I'll drink a couple cups a week. My husband wants a lot of caffeine but really only drinks it on the weekend. So a few years ago we invested in a single serve coffee brewer and it was the perfect solution for us. 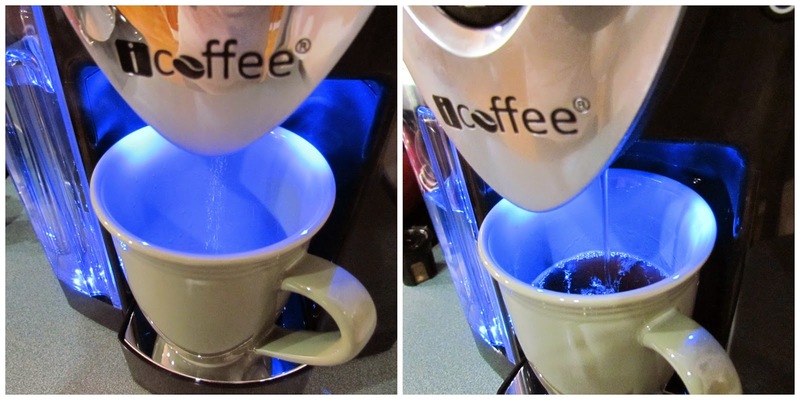 But when I was contacted by iCoffee by Remington for review, I knew I wanted to try it. They have this unique technology called the SpinBrew Technology. What the SpinBrew does is the needle that distributes the water spins around dispersing the water through the grounds thoroughly. It creates a mini french press like effect. The Opus brewer that we received comes with the brewer, magnetic drip tray, a reusable cup and a sample pack of 6 cups of coffee. Just press the button to lift up the hatch. Put in your cup (it also accepts all kinds of k-cups). 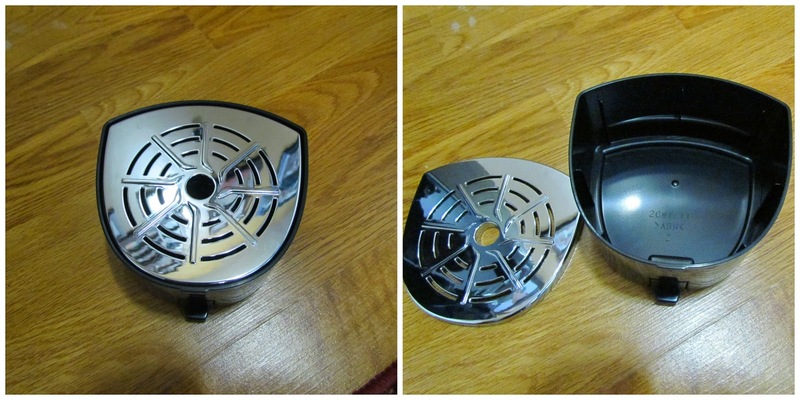 Drip tray comes apart for easy cleaning. And the flatter part is magnetic so it sits nicely on the bottom of the brewer with minimal movement. To set up the brewer, just plug it in and push the power button. It will warm up the water inside the chamber. This usually takes about 1-2 minutes. It will tell you when it's ready. 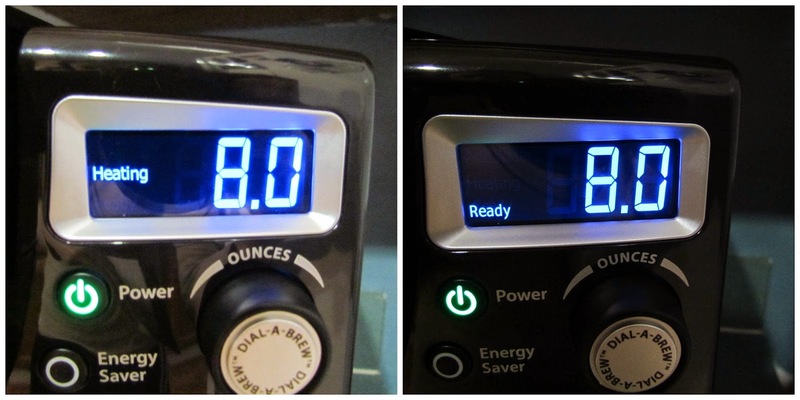 Then you just turn the dial to select your onces you want brewed. It's in .5 ounce increments from 4-12 ounces. Then just push the dial and your cup will brew. The reservoir is 75oz which is quite large. I had it almost to the max fill line, and this is after one cup of coffee (but it holds some in the other water reservoir on the back of the brewer. The machine is super easy to set up (don't forget to run a few cups of hot water through it first before brewing coffee). Although it does brew a bit slower than the Keurig, the coffee comes out smoother and better tasting. My husband even says so. So it takes its time and slow and steady almost always wins the race. I do not like that it shuts off after a certain time (24 hours I believe, or it's like 2 if you hit the energy saver button. This means that when you want a cup of coffee, you have to push the power button again and wait about 2 minutes for the water to heat up. It makes things a little inconvenient, BUT it's still faster than a traditional coffee maker. Overall my husband and I love this brewer. The LED's make it look very sleek and attrctive. The large reservoir is great as we have to fill less often. I use the reusable cup so I can buy ground decaf coffee. And I always had a problem with it geting groudn everywhere. Until I discovered I was using it wrong. Now there's no issues!!! So glad my husband figured that one out! I thought you had to remove the pod cup in there and put in the reusable like you do with the Keurig. But in fact the reusable cup fits in the regular cup on the machine already. It's solved my problem. Price: This maker is $140. Which is very reasonable and competitive. Overall: ***** from us! We love it just as much as the Keurig, but more because of the smoother taste! I have never heard of SpinBrew Technology, but this is really a cool looking and modern coffee brewer. It would be great to try. I had never heard of this brand, let alone the technology behind it. I am going to look at this for my next coffee maker! We have a single serve maker too and love it! I had never heard of this machine until yesterday. Since then, I have heard it mentioned at least three times! Must be a sign? I love the flavor of french press coffee, but it takes so much work! Sounds like I may need to try this! I love my coffee maker but love the sound of this one as well. Nothing like a GOOD cup of coffee.